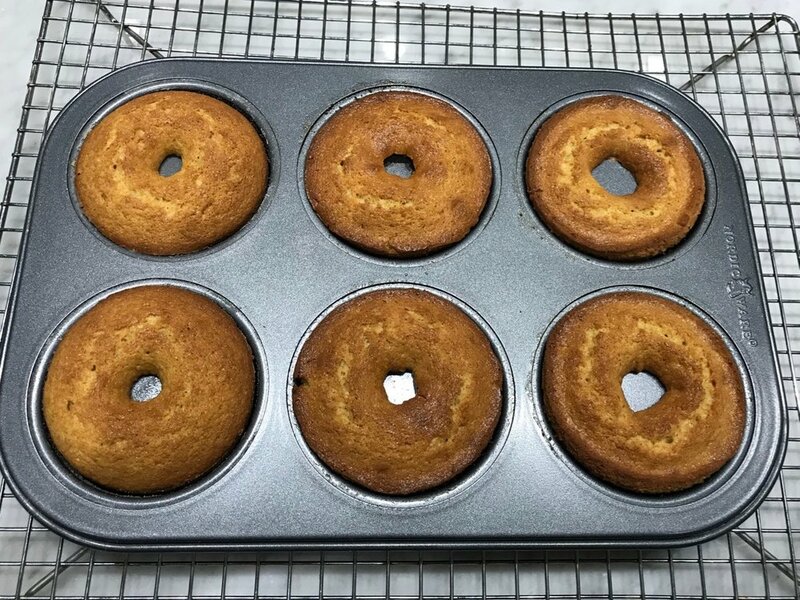 The purpose of all these tests for Part 1 and Part 2 of "The Power of Flour" was to determine the optimum level of baking powder when using my two-stage method of mixing cakes to be baked in 9 by 2 inch high pans. The 'control' cake for Part 1 was the All-Occasion Downy Yellow Cake from The Cake Bible, which uses cake flour and all egg yolks, adapted from two 1-1/2 inch high pans to a 2 inch high pan. > with 3 egg whites: baking powder increased from 2-1/2 teaspoons to 3-1/4 teaspoons. > with 2 whole eggs: baking powder increased from 2-1/2 teaspoons to 3-1/2 teaspoons. > with 3 egg whites: baking powder increased from 2-1/2 teaspoons to 3 teaspoons. > with 2 whole eggs: baking powder increased from 2-1/2 teaspoons to 3-1/4 teaspoons. > with 3 egg whites: baking powder increased from 2-1/2 teaspoons to 2-5/8 teaspoons. Notes: We were surprised to find that though using all egg whites makes the structure stronger, using whole eggs makes it stronger still. These results are predicated on weight of the major ingredients. If using volume for the eggs, be sure to measure them as the proportion of yolk to white varies from egg to egg. If using egg whites that have been frozen, be sure to stir the thawed whites well with a fork to combine evenly. A 2-inch high pan makes a very nice single layer cake. If making just one layer you may want to decrease the baking powder by 1/4 teaspoon to give it a slight dome. If making a two layer cake everything should just be doubled. Final Conclusions for Part 1 and Part 2: Egg yolks give cake a fuller flavor, egg whites give cake a softer texture. Egg whites will need more leavening than yolks (exact amount depending on the cake). Whole eggs will need more leavening than whites (exact amount depending on the cake) Cake flour and bleached all-purpose flour result in the best flavor and texture in cake. If using unbleached all-purpose flour, the best flavor comes from replacing 15% of the flour with potato starch. The most level cake comes from using egg yolks or whole eggs. comes from using egg yolks or whole eggs. We frequently receive comments and queries about what type of flour to use for butter and oil based cake baking with baking powder/baking soda as the leavening agent. This is a reposting of our March 6, 2010, as our findings then still apply. Even more so with some current brands of cake flours now being unbleached. For years I have been saying how important it is to use bleached flour whether all-purpose or cake flour in cake baking and I still prefer it, but after making the fortuitous mistake of using unbleached flour in a cake baked in a tube pan, and discovering that the pan's center tube kept it from falling, I have revisited the subject and made some very interesting and ground breaking discoveries. Woody and I have conducted numerous tests using bleached cake flour, bleached all-purpose flour, and unbleached all-purpose flour in a solid (unmelted) butter layer cake using my one bowl mixing method and the All-Occasion Downy Yellow Cake from The Cake Bible. (We used two-thirds the recipe, first using two-thirds the baking powder (2-5/8 teaspoons). Then we decreased the baking powder to 2-1/2 teaspoons because we were using a 2 inch high pan instead of the 1-1/2 inch high pans in the Cake Bible (and higher pans need proportionately less baking powder). We found that when using bleached or unbleached all-purpose flour instead of cake flour, we got more tenderness (and in the case of unbleached flour improved flavor) by replacing 15% of the flour with potato starch which comes closer to cake flour than cornstarch.The overall appearance, however, with the bleached all-purpose flour is slightly lower either in height or in the center. 4. bleached flourresults in the best flavor. At first I thought it was an inherent contradiction that unbleached flour, which is higher in protein, would result in less volume, which usually is an indicator of structural weakness, and yet be chewier, which usually is an indicator of greater structural strength. As I was going to sleep one night I was so disturbed by this thought that I pretended I was inside the structure of a cake and started picturing a mesh of wires like a metal fence. Then the thought hit me like lightening: If one were to snip those wires, the fence would collapse but if one tried to chew on those wires they would still be wires--hard and unyielding even though not strong enough to hold up as a fence structure! And then it seemed obvious that a cake made with the higher protein of unbleached flour would have a tougher but not necessarily stronger structure! (A good metaphor for defining how strength comes in different forms!) I then remembered what I had learned about the different types of gluten-forming protein contained in flour when I was working on recipes for The Bread Bible. One type of gluten is elastic and results in a more chewy texture. The other type of gluten is extensible (stretchy) and enables a bread or cake to rise higher without collapsing. Bleached flour also has a lower PH, which means it will gelatinize (set) more quickly and thus maintain its structure. For bakers who either have no access to the bleached flour or prefer to use unbleached flour, Kate Coldrick's method of heat-treating flour in a microwave enables the flour to gelatinize more effectively and the addition of xanthan gum also strengthens the structure. Our website has a posting: Kate of Kate’s Flour with instructions on how to make it. Solutions & Options if Replacing Bleached Flour with Unbleached Flour The customary technique to approximate cake flour when using bleached all-purpose flour is to replace 15% of the flour with cornstarch or potato starch. These starches gelatinize at lower temperatures (potato starch much lower than corn starch) than does the starch in flour, thereby improving the structure of the cake. We found that the cornstarch mixed with the bleached all-purpose flour resulted in a cake that was almost as tender as cake flour, and eliminated the slight dipping in the center. In our next series of tests, instead of cutting the bleached and unbleached all-purpose flour with cornstarch or potato starch, we lowered the baking power by 1/8 teaspoon (to 2-1/2 teaspoons per 200 grams/7ounces flour). Baking powder reacts with the liquid in the batter and the heat of the oven to produce bubbles that enlarge and ultimately disrupt the network structure of the batter. Flour that has greater elasticity allows the network to expand more before breaking, giving more time for the heat penetration to set the structure, preventing collapsing or dipping. Decreasing the baking powder is less disruptive to the structure and thus completely prevented the cakes made with the all-purpose bleached and unbleached flour from dipping. It also resulted in better flavor than the cakes made with the addition of cornstarch. The texture of the cakes was slightly less tender but also less dense. To see if we could achieve the same tenderness of cake flour using all-purpose bleached flour with the correct lower amount of baking powder we tried one with the added cornstarch (see the third photo down) but it caused it to dip 1/4 inch. Note how the unbleached has the darkest crumb.